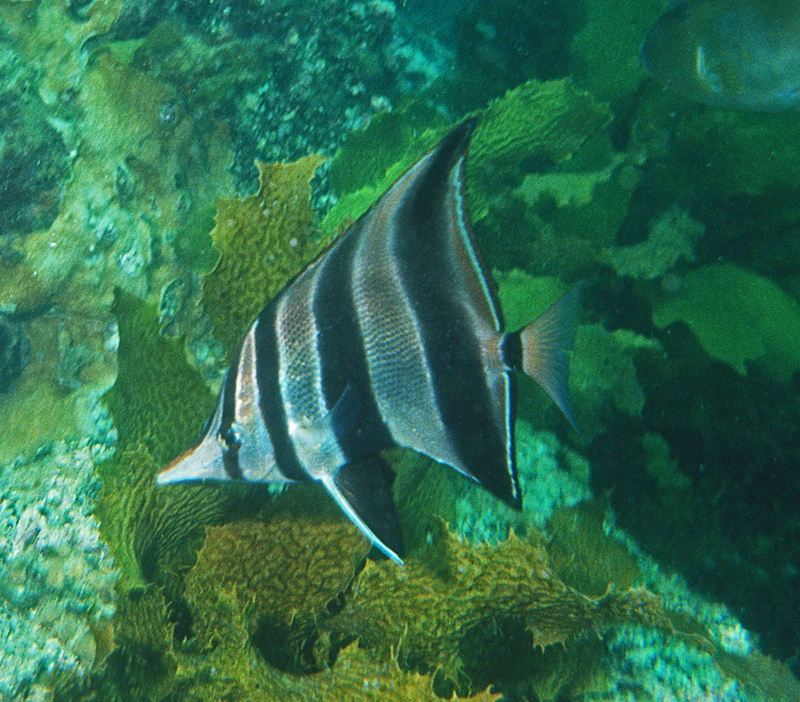 I am snorkelling just below the old Rapid Bay jetty. 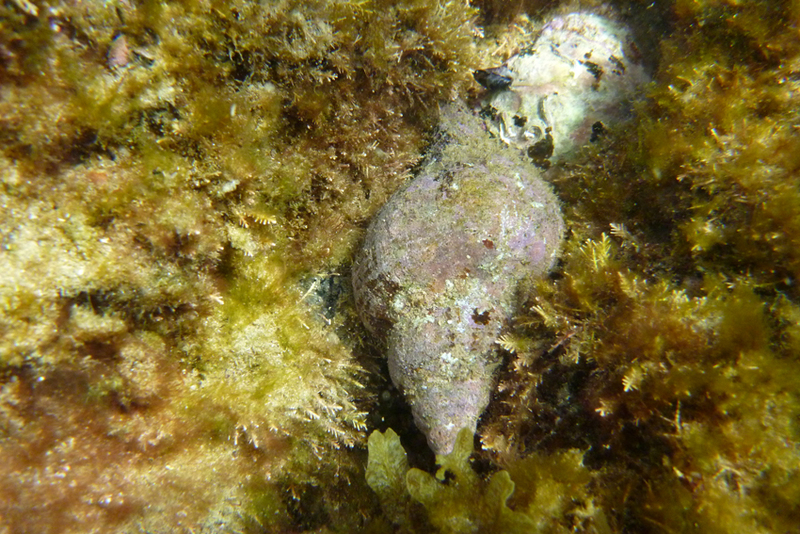 The poles are covered with sea squirts, sponges and a variety of algae. Seastars and urchins forage amongst this tangle of encrusting organisms and mixed schools of bait-fish dance around the timber uprights. Closer to the sea floor I can see some large rocks that form a shallow reef. Many are the result of mining or the remnants of an old breakwater. Like the jetty poles the reef has also been colonized by a myriad of marine invertebrates providing the perfect environment for the more residential species of fish that I am here to photograph. In a slight depression near the bottom I come across a moonlighter swimming over a brownish coloured sponge. Size: Length to 40 cm. Where the water is a little deeper I manage to position myself at the end of a narrow cave and capture a nice image of a pair of old wives that are using it as a shelter. Size: Length to 31 cm. 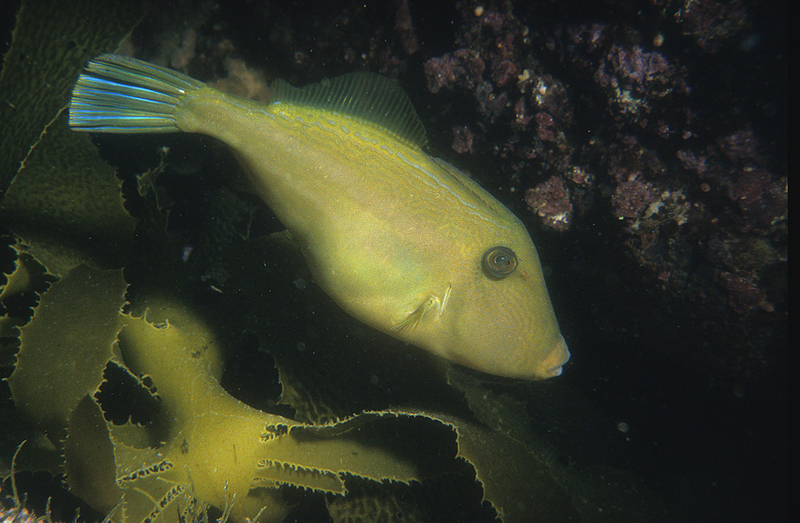 My final image is of a western talma a kind of butterfly-fish as it picks tiny invertebrates from some brown algae. Size: Length to 20 cm. 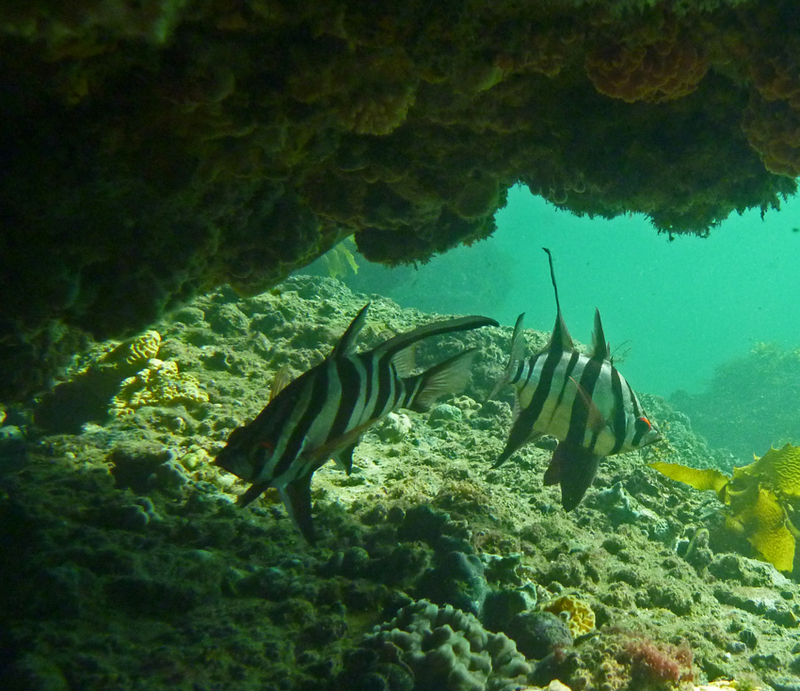 Lives around rocky reefs often under ledges and near crevices to depths of 40 m.
It has been a wonderful dive and Rapid Bay is a place to explore some of the State’s most enchanting wildlife in a great setting. And if you are lucky there is also the opportunity to catch sight of both leafy and weedy seadragons. But I’ll leave that adventure for another post. 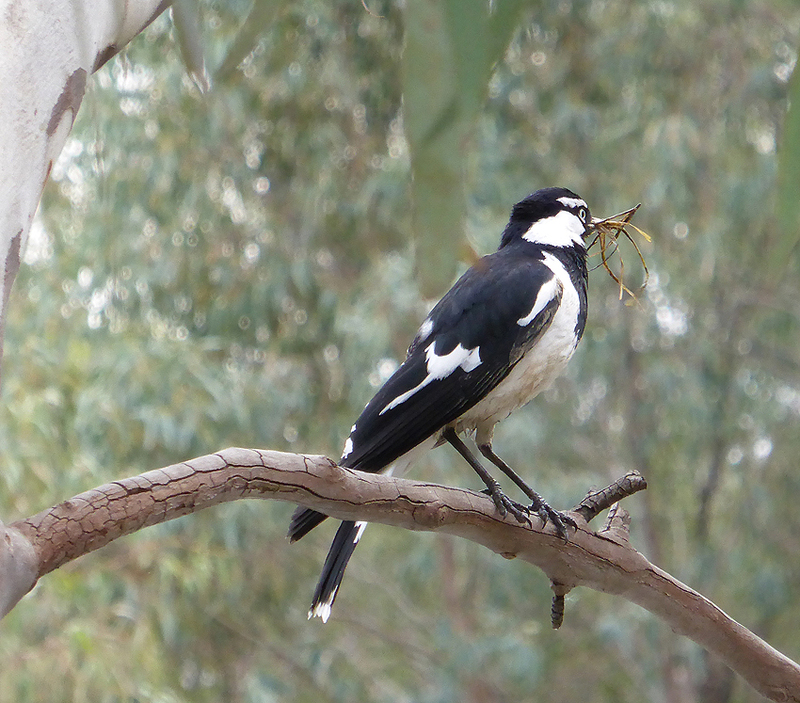 Over the next few months I will be writing a book about the wildlife of the Fleurieu Peninsula. My posts will reflect the research I am doing and provide more detailed information about the animals I encounter. 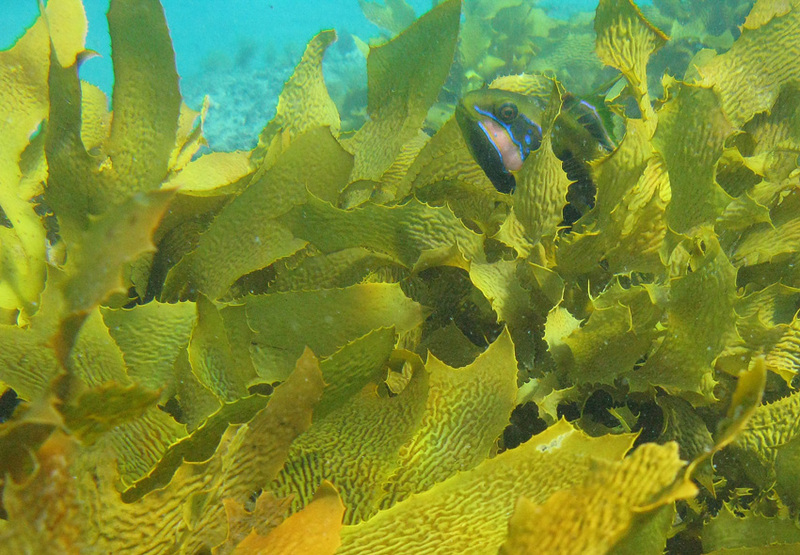 I am snorkelling along the edge of the reef just off Aldinga Beach. The water is shallow and warm with just a light breeze ruffling the surface. 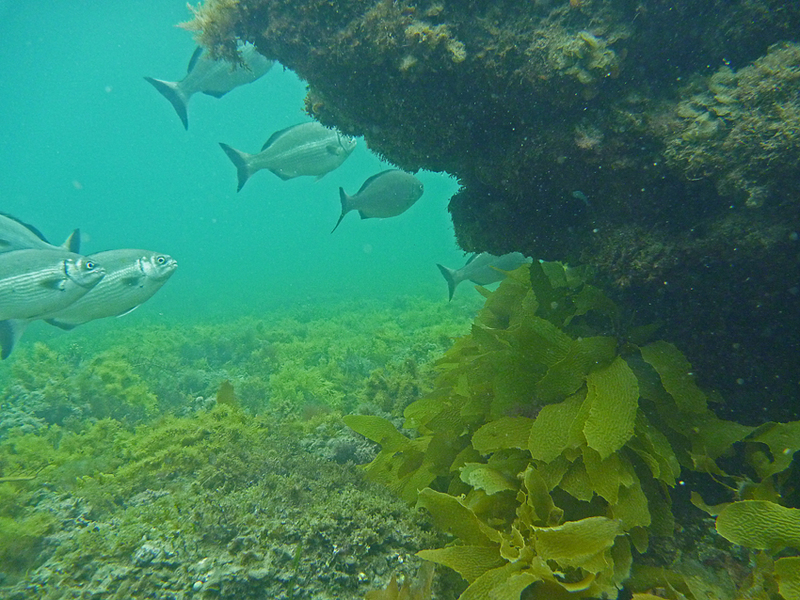 Below me the terrain changes from seagrass to sand with a little outcrop of rocky reef in between and I am intent on photographing the variety of marine organisms that inhabit these different habitats. The reef has numerous invertebrates clinging to, and encrusting its wide variety of niches and a biscuit star is my first sighting. 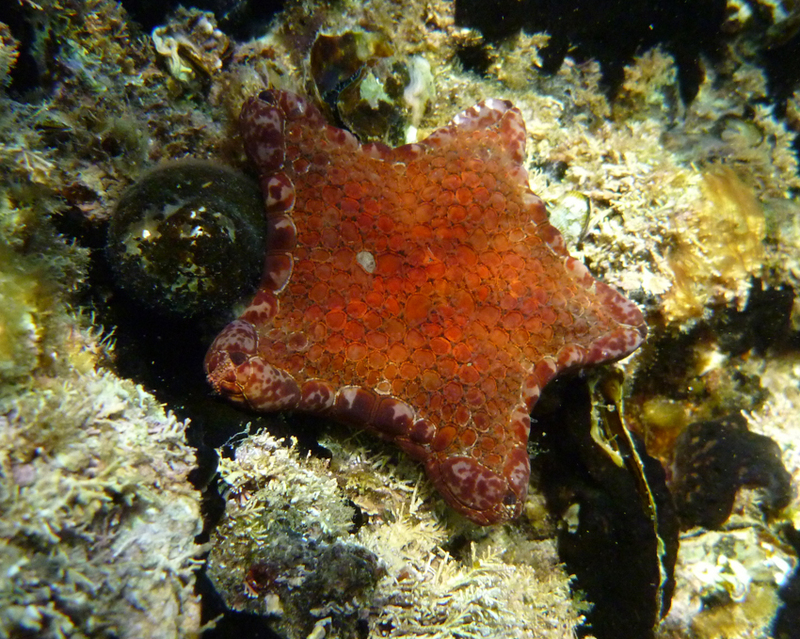 This pentagonal little seastar can be found on reefs and rocky surfaces and has a number of colour variations between light orange to reddish. It has quite large overlapping plates on its surface and has an arm radius up to 7cms. Leaving the little patch of reef behind I start to scour the seagrass bed where it meets the sand patches. 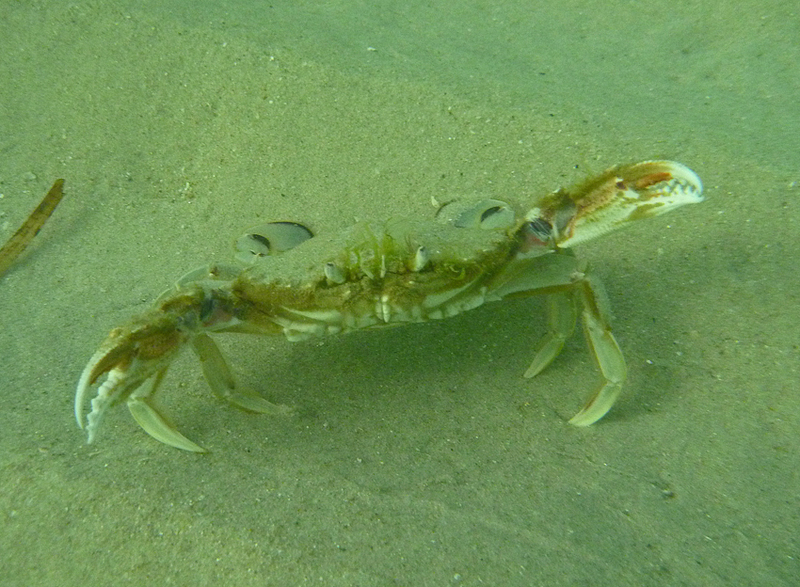 My choice of location pays dividends as I disturb a blue swimmer crab that has been hunting in the seagrass. 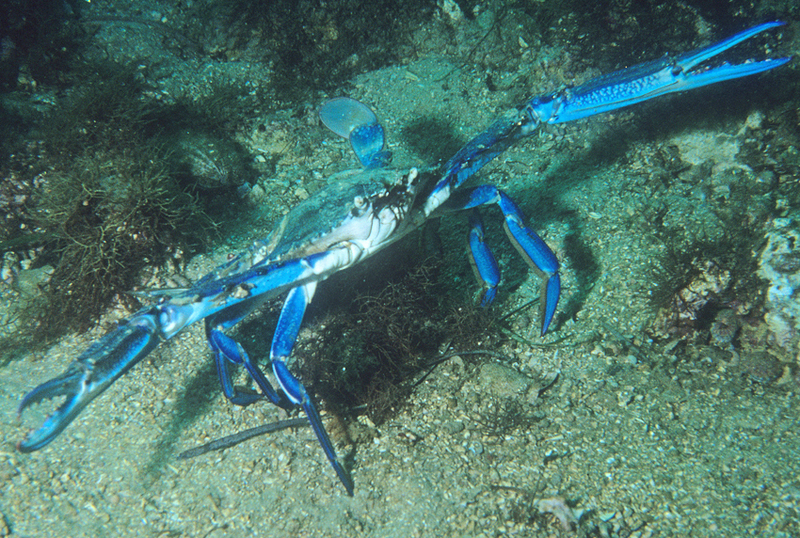 Blue swimmer crabs have large pincers on their two front legs and paddles on the rear pair. 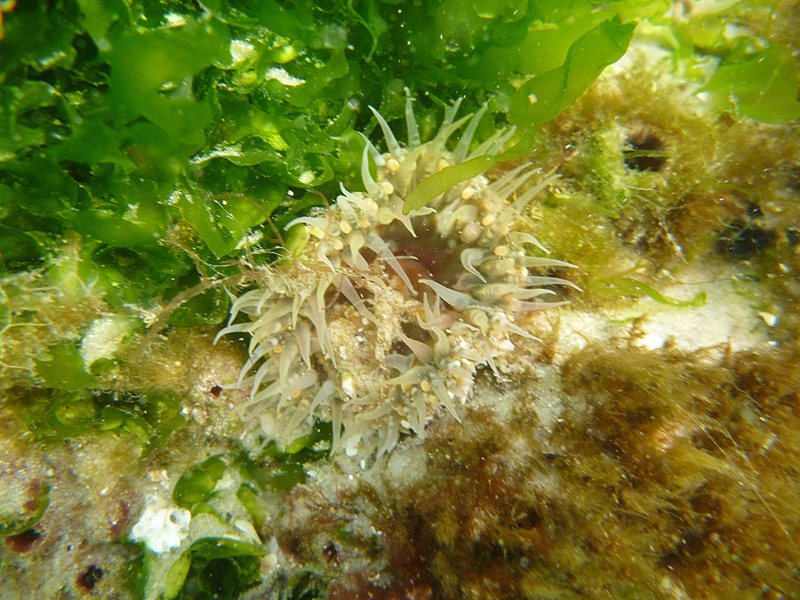 They can be seen moving along the bottom in weedy and sandy areas but often bury themselves in the soft sand and mud. 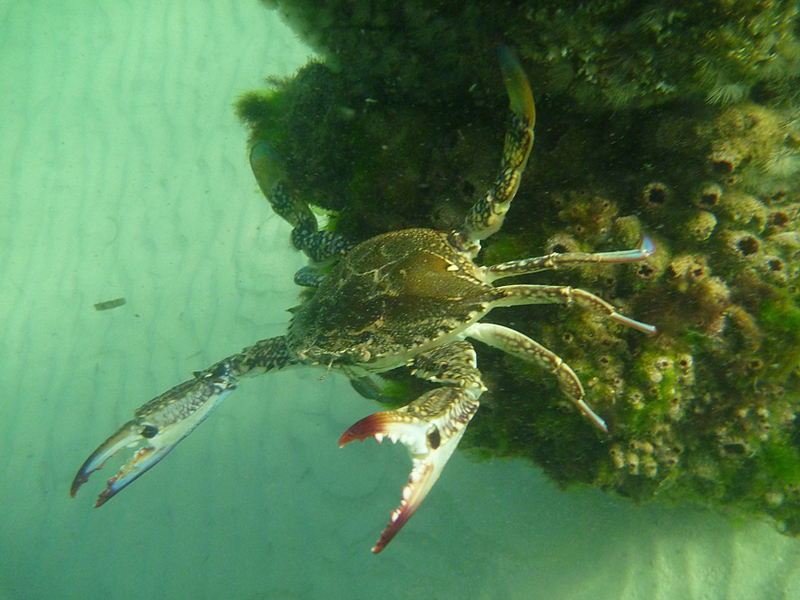 These large crabs can be quite aggressive when approached and feed on live animals as well as scavenging. 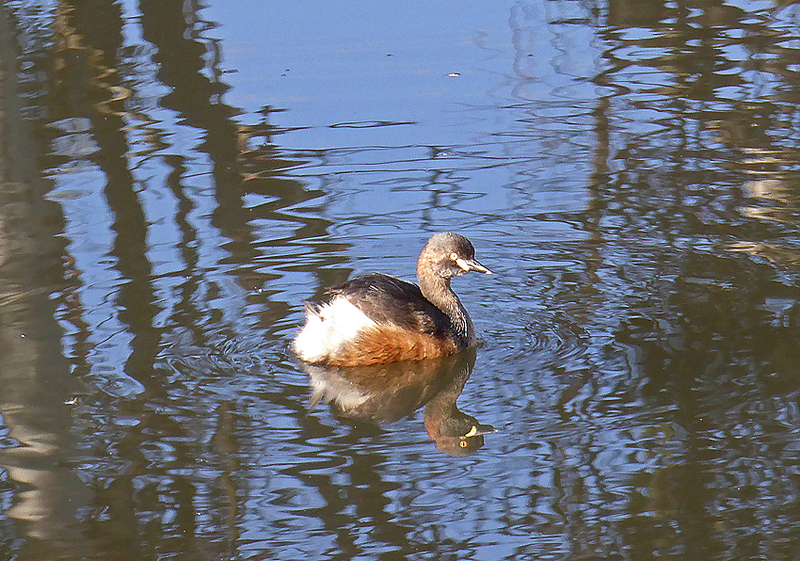 They are migratory appearing from September to April in SA waters. Taking female Blue Swimmer Crabs with eggs and animals under 11 cms is illegal and there is a personal bag limit of 20 crabs per day. These restrictions help preserve the numbers of this commercially and recreationally valuable species. These invertebrates are just two of my many encounters on the reef and the bushland around the Fleurieu Peninsula and I shall continue this story in my next post. 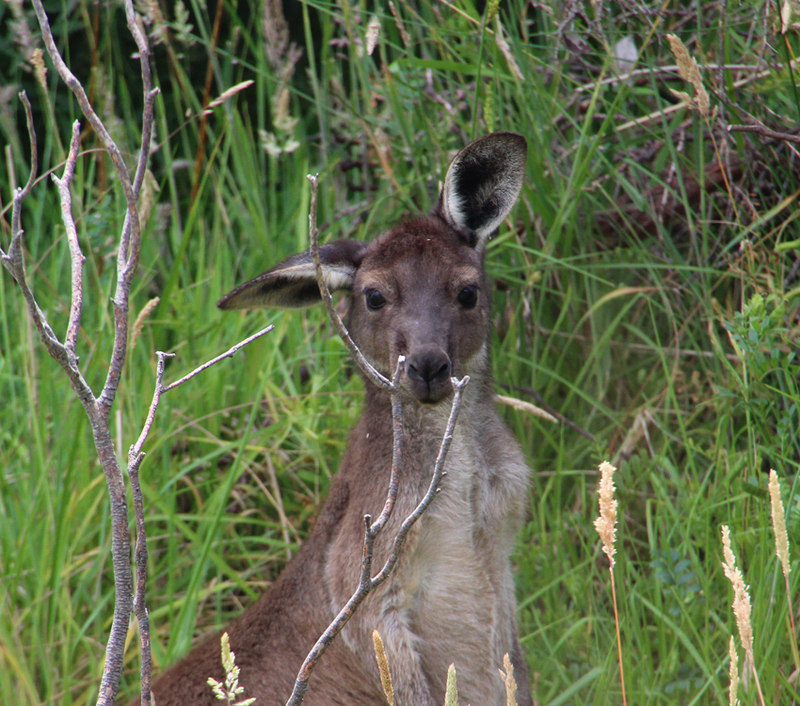 Over the next few months I will be writing a book about the wildlife of the Fleurieu Peninsula. My posts will reflect the research I am doing and provide more detailed information about each animal that I encounter. 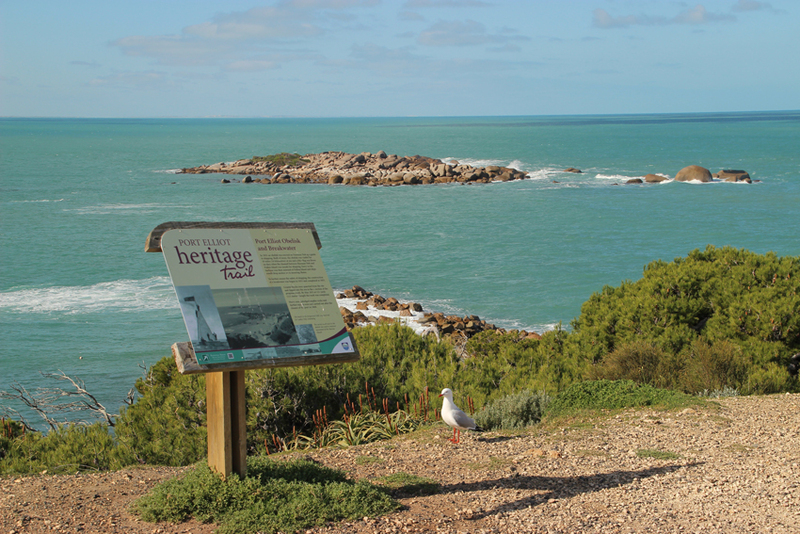 The Soldiers Memorial Gardens overlooks Horseshoe Bay; one of the most picturesque locations on the Fleurieu Peninsula. Well kept lawns are surrounded by flower beds and fronted by massive Norfolk Island Pines that attract a wide variety of wildlife. 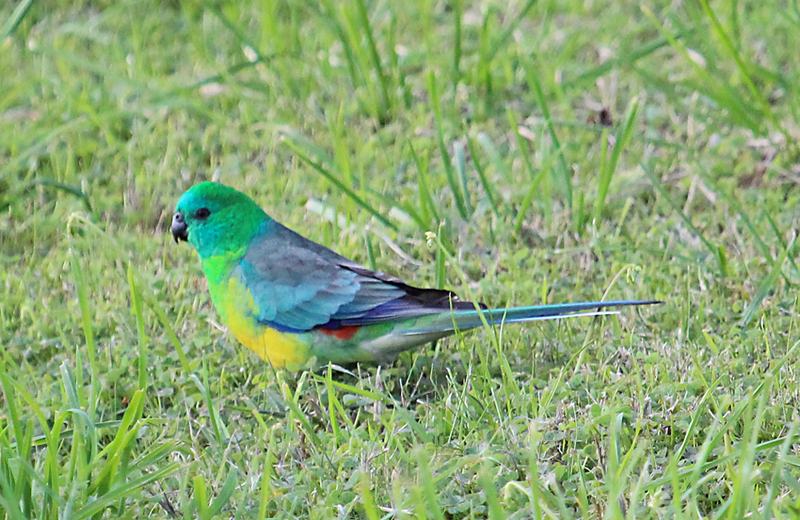 Today the grassed areas have just been mown and two beautiful, red-rumped parrots are feeding on some seed heads that have been scattered by the mower. Male birds are more colourful than the females with brighter plumage and a red splash of colour on the lower back. 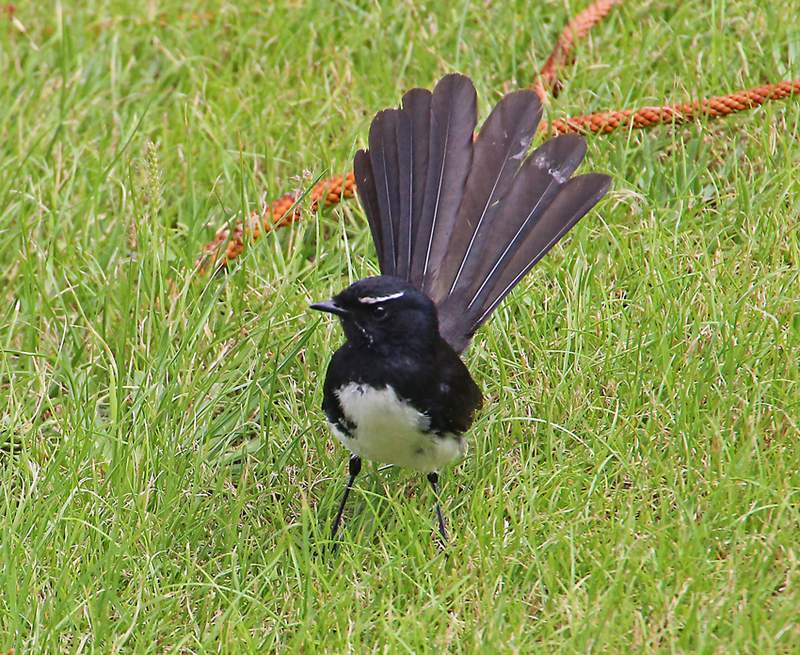 The gardener seems to have also stirred up some insects which are being vigorously hawked by a lively little wagtail. Near the gardens a track runs along the coast towards the jetty and then along the face of boulder strewn cliffs. 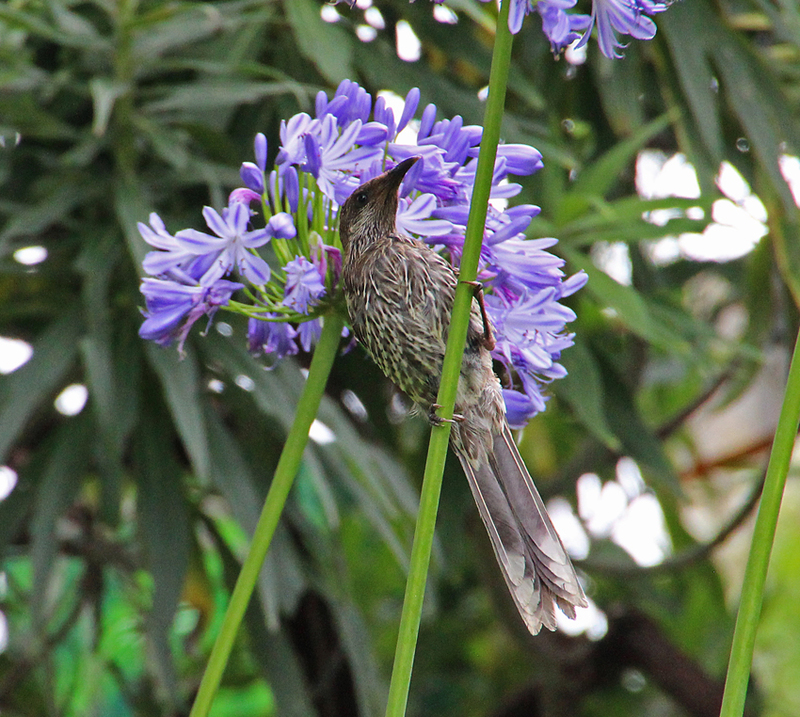 Several wattle birds are gathering nectar from coastal blooms of agapanthus and I can see both terns and silver gulls patrolling the wave break in search of prey. There are rocky outcrops at both ends of Horseshoe Bay and small islands in the mouth. These are home to a myriad of sea creatures. 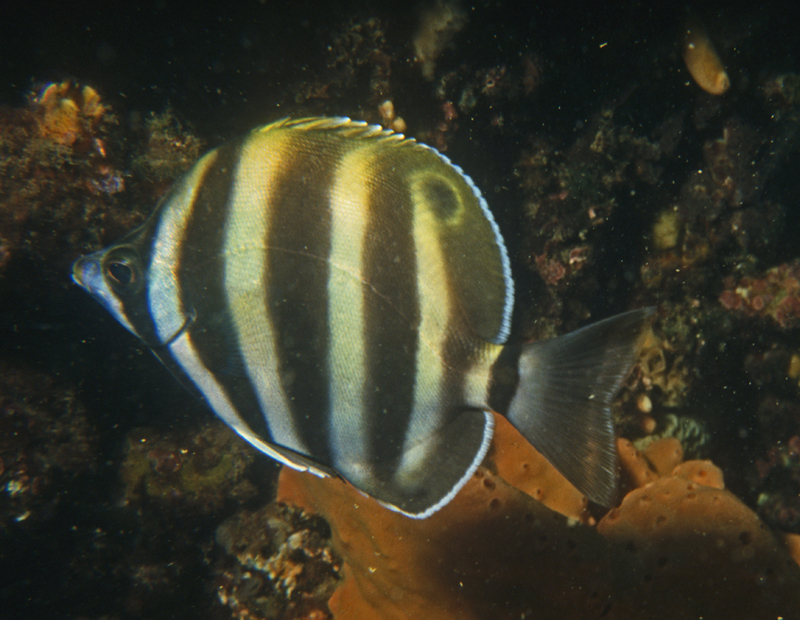 Sweep, drummer and zebra fish are just a few of the fish species that abound here. The rugged, algae dominated rocks also provide habitats for a wealth of invertebrates including: crayfish, crabs, sea snails, sponges and starfish…to name but a few. From a high point on the coastal path I have a good view of the bay and I take some time to sit and eat a snack from the Local Port Elliot bakery. Behind me I can hear the call of singing honeyeaters and in front the gentle rushing sound of the incoming tide and surf on the rocks….. a fine way to finish my visit to Horshoe Bay. This is an easy walk which is quite suitable for families and seniors with public toilets, food outlets and parking nearby. 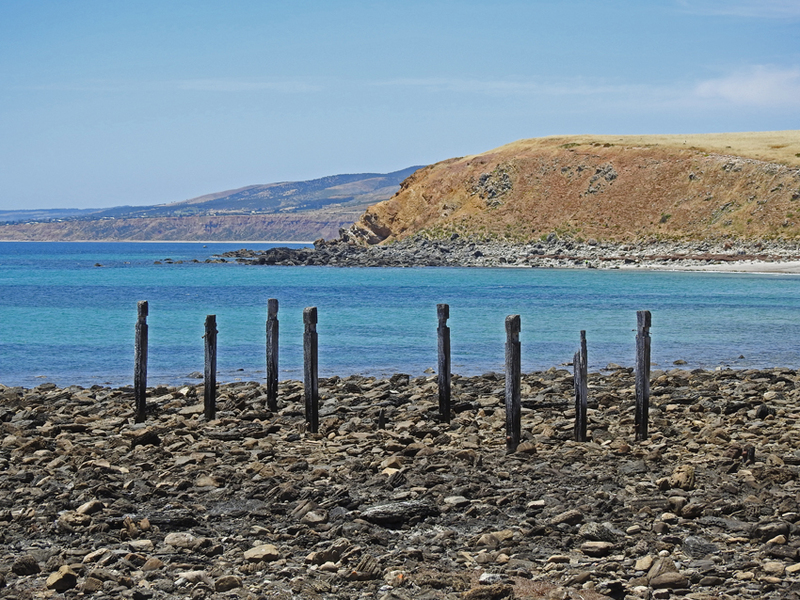 The drive from the little Fleurieu town of Myponga to the beach some 10 kms away is rather unique. 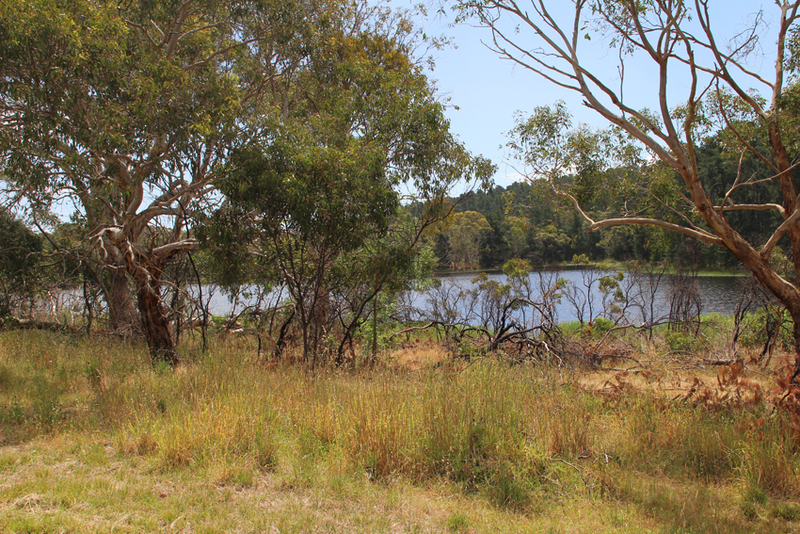 It takes in views of the local reservoir, bushland and sweeping rural scenes before descending towards a picturesque beach characterised by a small creek and the skeletal remains of an old wooden jetty. All the way along this route there is a proliferation of wildlife if you take the time to stop and look around. My first wildlife encounter on the drive from the township to the beach was a pair of grey kangaroos feeding along the banks of the reservoir. One animal seemed unperturbed by my presence and cocked its head cheekily as I closed in to capture an image. 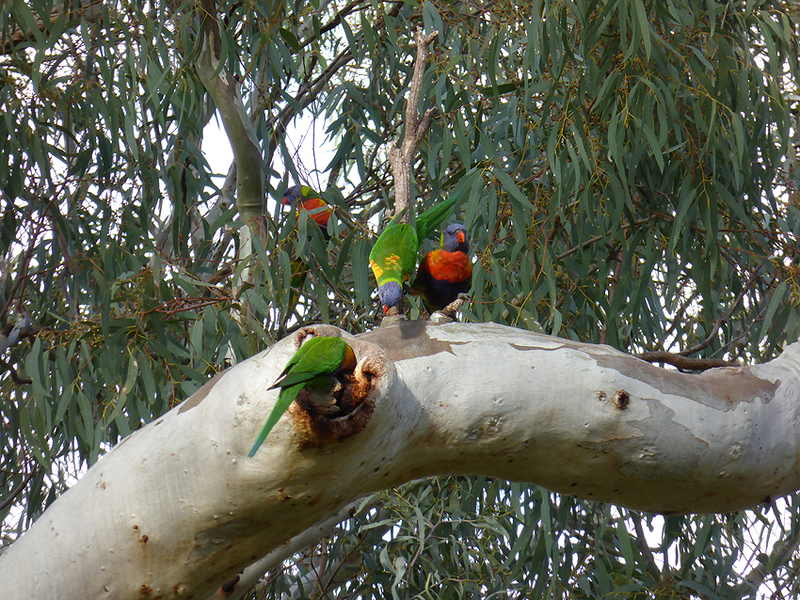 Further along the well graded dirt road I noticed numerous parrots in the eucalypts, they appeared to be feeding on gum nuts and blossoms. 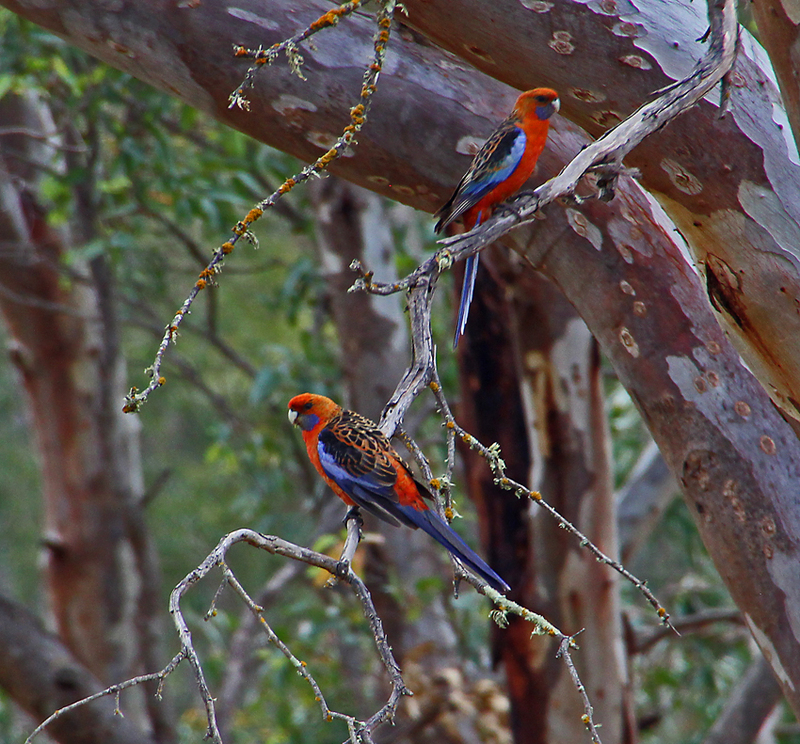 One pair of crimson rosellas caught my eye. They are wary birds and hard to approach so I tried for a distance shot in the shaded heart of the trees. Their glorious red plumage allowed them to dominate the background making for a rather nice image. Birds posing against the rugged background seemed to be a recurring theme and an Australian magpie perched on the end of a weather beaten branch provided the next wildlife moment. 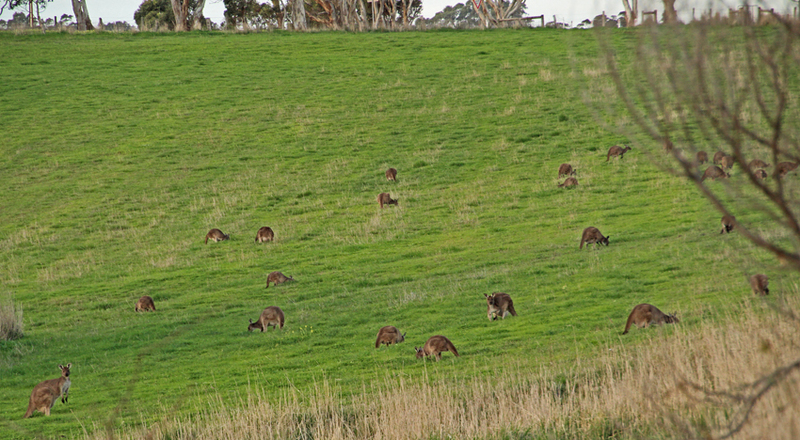 However, as I stopped the car and stepped out to take my picture I noticed the field behind the bird was dotted with the grey brown shapes of kangaroos. There must have been over twenty of them leisurely grazing on the freshly cut pasture. It would have been easy to stop at this point and simply focus on the terrestrial wildlife but my heart was set on doing a little snorkelling when I reached the beach. 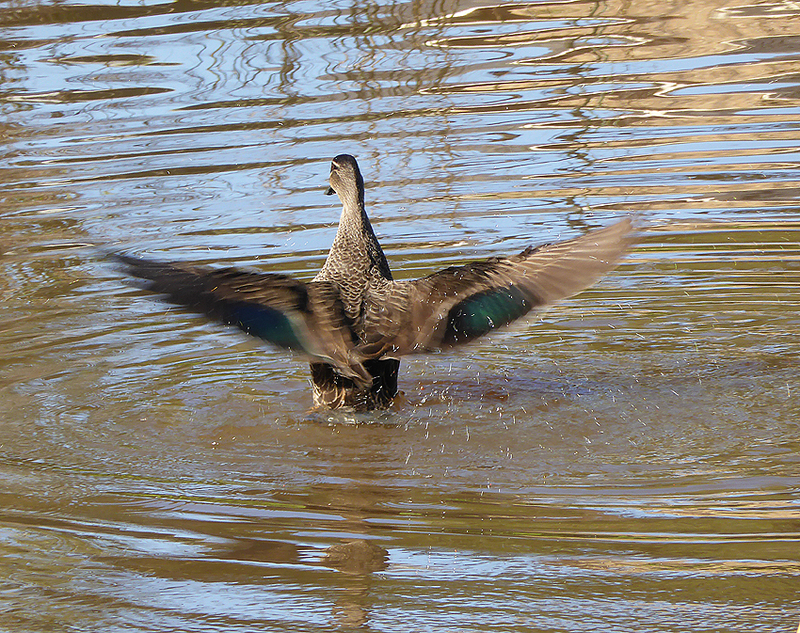 It was a warm day and the cool water would provide some welcome relief. My decision proved to be worthwhile and without going into too much detail I spent a good hour photographing colourful fish amongst the rocky inshore reef and algal beds. A wonderful finale to my day notwithstanding a much anticipated trip to the Myponga Bakery on the way home for a meat pie and vanilla slice. 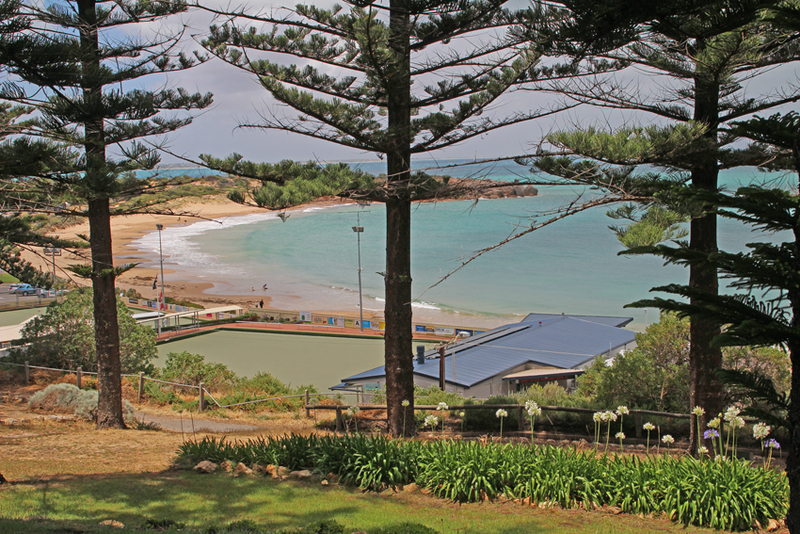 This is an easy drive which is quite suitable for families and seniors with public toilets, barbecues, food outlets, parking and other facilities at Myponga. 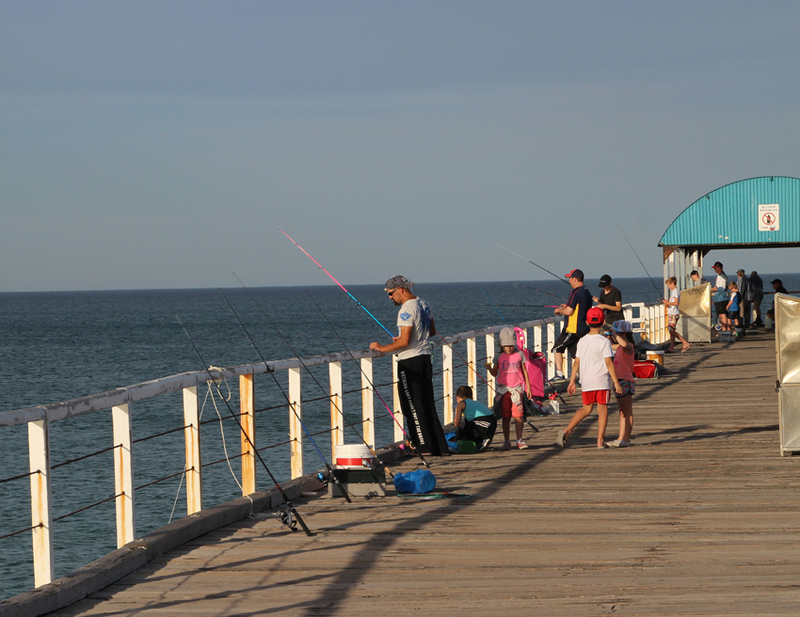 As I walk along the Semaphore jetty I can see several anglers working the shallows for silver whiting. Further along, another fisherman is jigging for squid. His bucket is half full of small baitfish and an opportunistic silver gull is sitting on the railing eying the contents as breakfast. 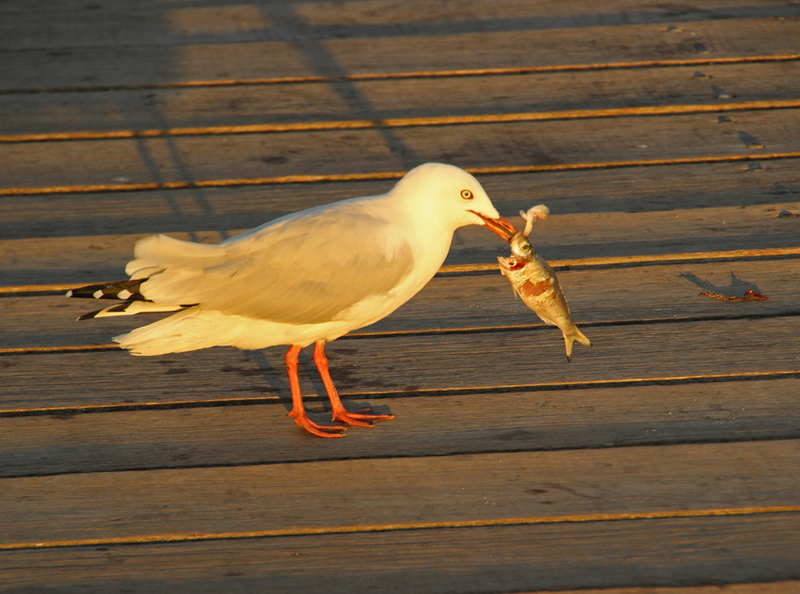 The angler is unaware of his feathery adversary and a few minutes later the gull grabs a fish and heads off down the jetty. 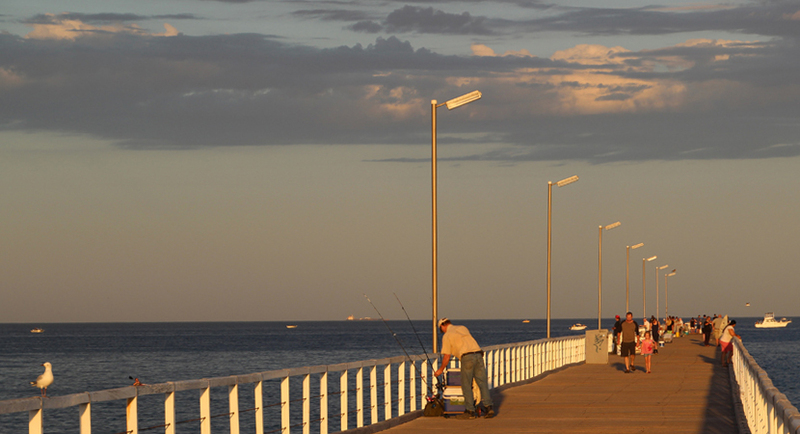 Semaphore is one of Adelaide’s original coastal suburbs and the jetty has been part of Adelaide’s beach scene for well over 100 years. It was originally used to moor pilot and customs craft. A coastal pathway follows the beachfront behind the dunes allowing visitors partial access to this protected area of sensitive coastal vegetation. The Esplanade, near the start of the jetty, is dominated by the iconic Palais Restaurant and Function Centre which was built in 1922. This Semaphore landmark has served as a bathing pavilion, dance hall, surf life saving club and kiosk before renovations in the 1990s. 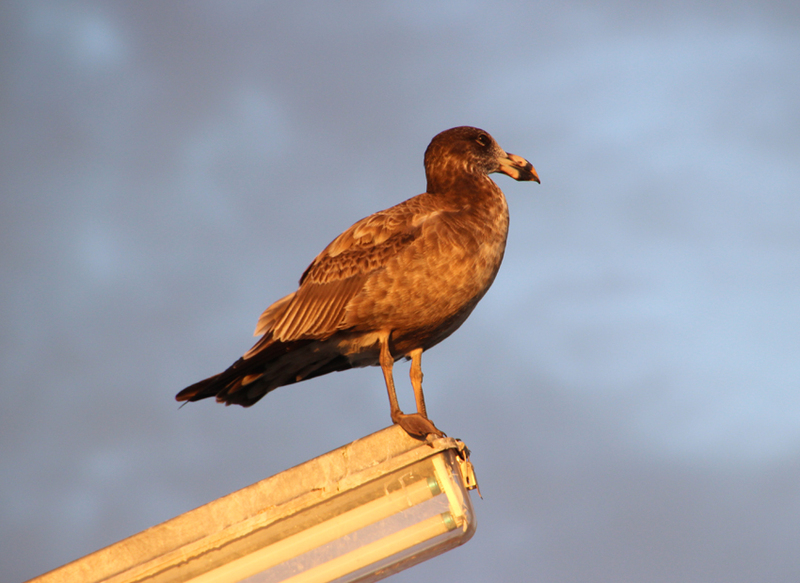 Closer to the shore a young Pacific gull sits on a lighting fixture watching the antics of its smaller cousins and keeping a watchful eye on the ocean ready to patrol the shoreline in search of its next meal. It is getting warm by the time I walk off jetty on to the beach where I have left some snorkelling gear with a family who are enjoying the solitude of an early morning dip. The water is clear and there is little tidal movement as I enter from the beach. 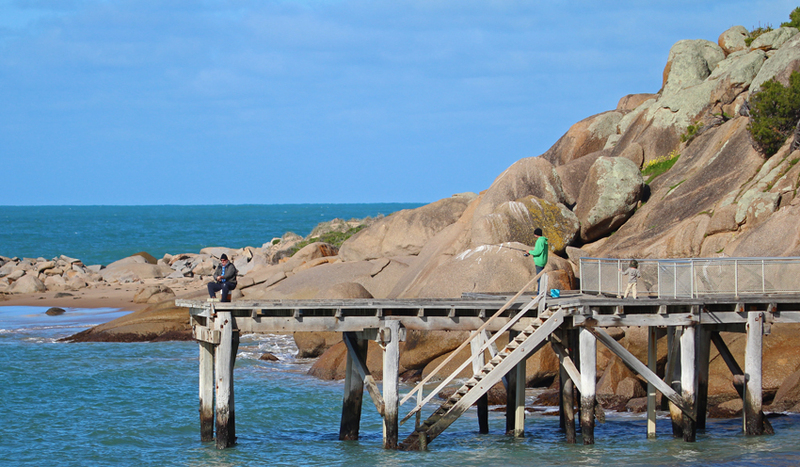 I follow the jetty poles out to sea as they provide shelter and food for a diverse collection of marine animals. It is not long before I notice a large blue swimming crab foraging near the bottom. We play a game of tag around the pole as the aggressive crustacean uses its powerful pincers to keep me at a distance. Half an hour in the water is enough to cool me off and I still want to walk along the pathway to search for birds and reptiles in the dunes before it gets too hot. 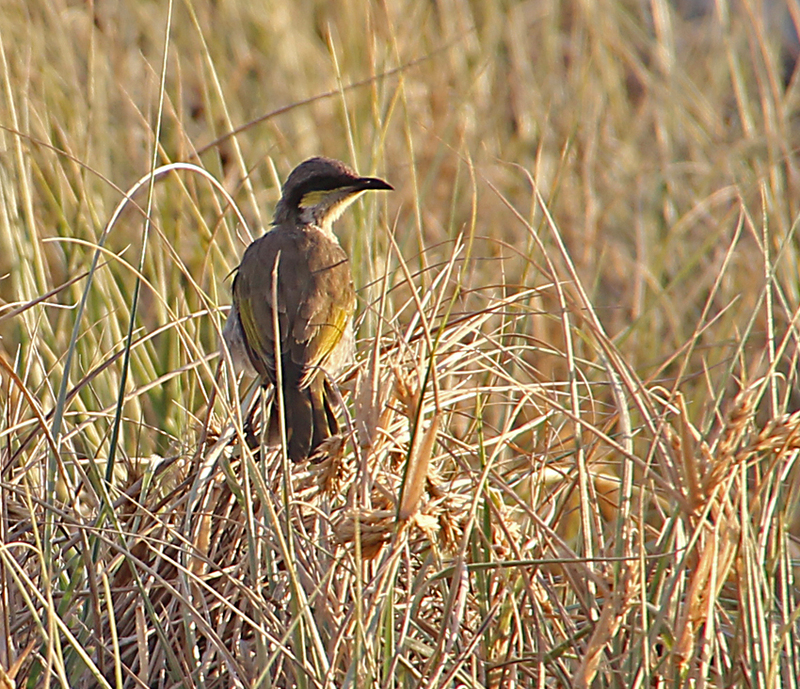 Most of the bird life has sought shelter from the sun but I do encounter one singing honeyeater amongst the grasses that bind the loose sand of the dunes. 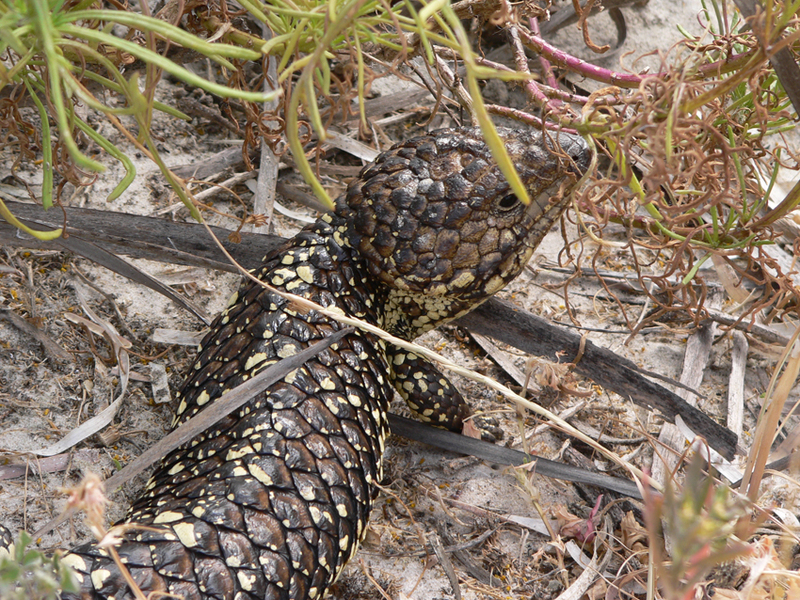 Along one of the trails to the beach, a sleepy lizard emerges from under a coastal acacia bush to eye me suspiciously before disappearing amongst the ground cover. Over the next half hour I stroll down couple more paths and sit quietly amongst some of the coastal scrub watching for tell tale signs of animal life. 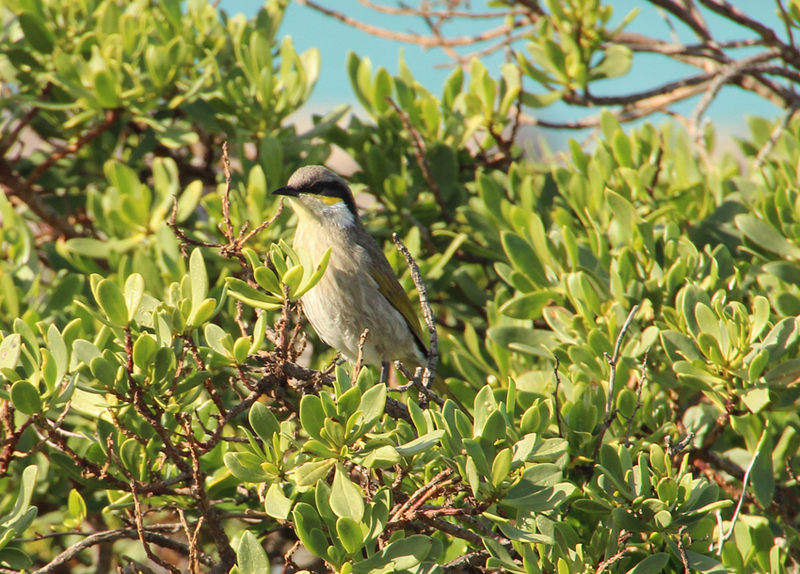 Numerous doves peck amongst the ground covers and a group of wattle birds squabble noisily in one of the larger shrubs. However, as midday approaches the sun and heat has obviously taken its toll on both me and the wildlife and it is time for a cold drink and lunch. 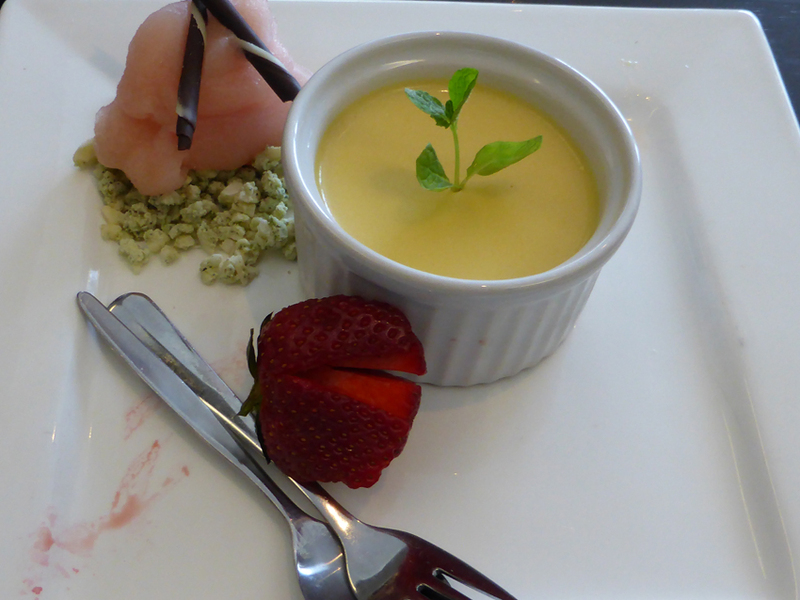 Needless to say, the Palais adequately provides both and as I look across the dunes from my table by the window, enjoying a delicate dessert, I reflect on how much I always enjoy my visits to Semaphore. The morning is warm and still with hardly a breath of wind. Although the water is not as clear as I would have liked it is worth putting on a mask and flippers to explore the shallows alongside the jetty. 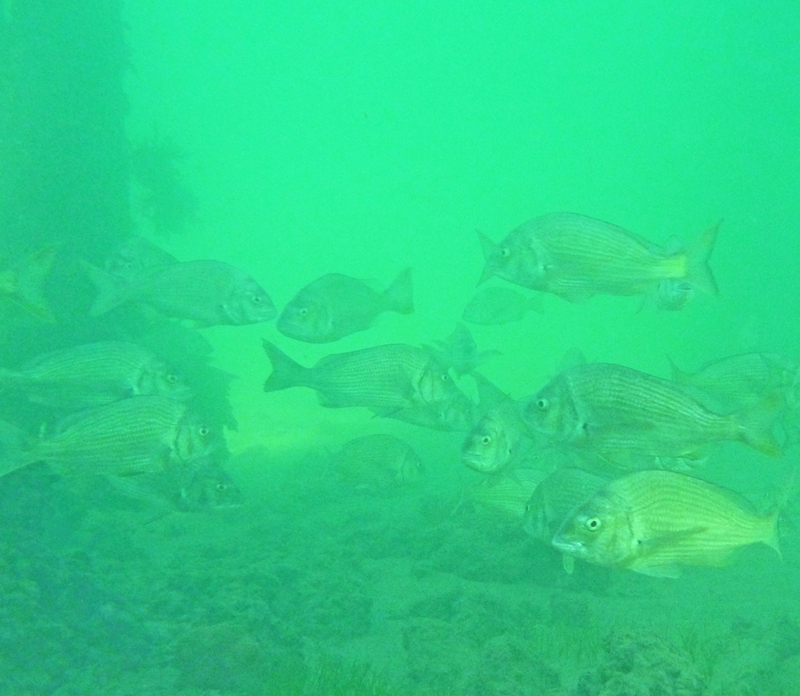 As I swim into the shadows beneath one of the jetty piles I can just make out a school of sizeable bream with a few silver whiting scattered amongst them. They are massing near the wooden posts directly below several fishermen who have empty buckets and a look of ‘no luck today’ on their faces. The wind is strengthening a little which often stirs up the sand and makes underwater photography challenging to say the least. It is time to switch to macro settings and look for small organisms on the sandy bottom. Numerous furrows snake across the undulating sand like roads through desert dunes. I follow one trail and probe the end point gently with my dive knife to see if I can reveal the perpetrator…no luck. But my digging does annoy a swimmer crab half buried in the sand only an arm’s length away. The little creature immediately strikes an aggressive pose angling up towards me with nippers spread and ready to attack. I spend a few more minutes exploring the various organisms that cling to the jetty piles. Satisfied with a few close up shots of anemones and sea squirts, I head for the change rooms and outdoor shower to wash off my gear. And then, the all important decision…. 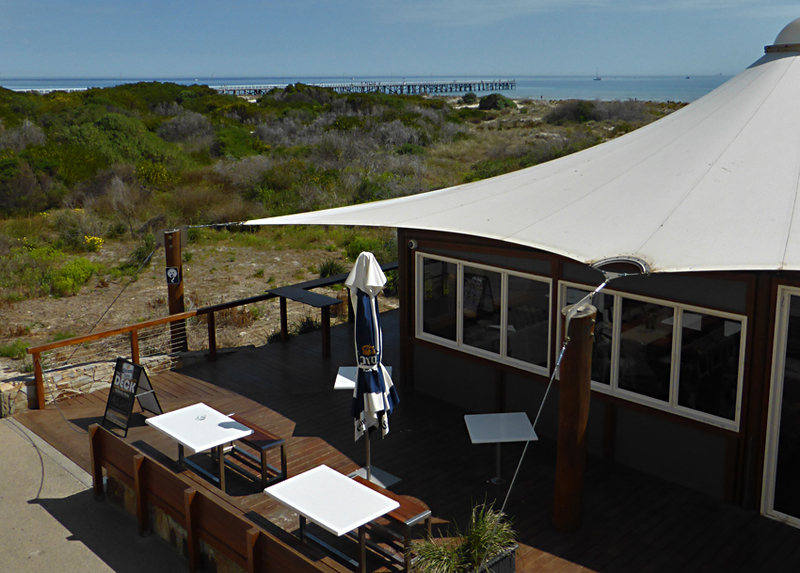 which of the beachside al fresco restaurants for coffee and breakfast? 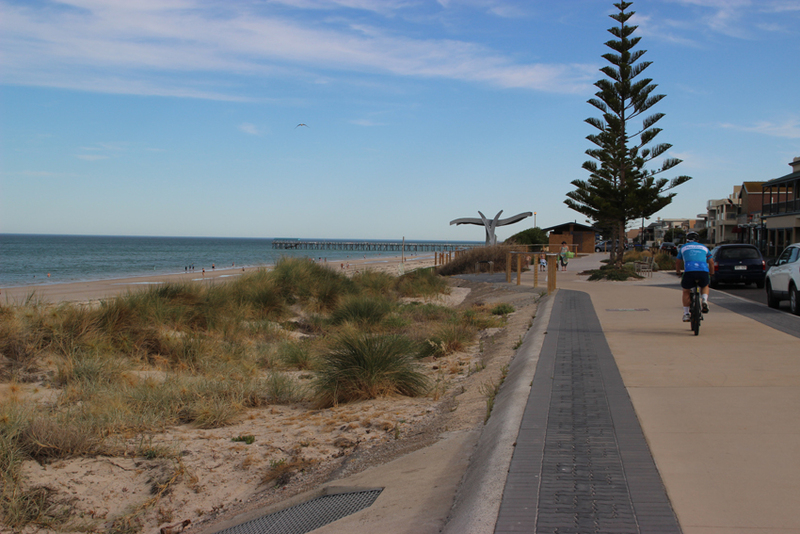 Henley Square at the foot of the jetty is one of Adelaide’s favourite beachside haunts where you will invariably find an eclectic collection of walkers, cyclists, fishers and even the odd naturalist; all enjoying the coastal ambience and quality restaurants. Refuelled and refreshed by my morning dip I walk south along the bikeway that skirts this section of coastline. Between the beach and the path there is a long stretch of low coastal dunes that have been revegetated over the last decade providing an interesting ecosystem that is home to a variety of plant and animal species. 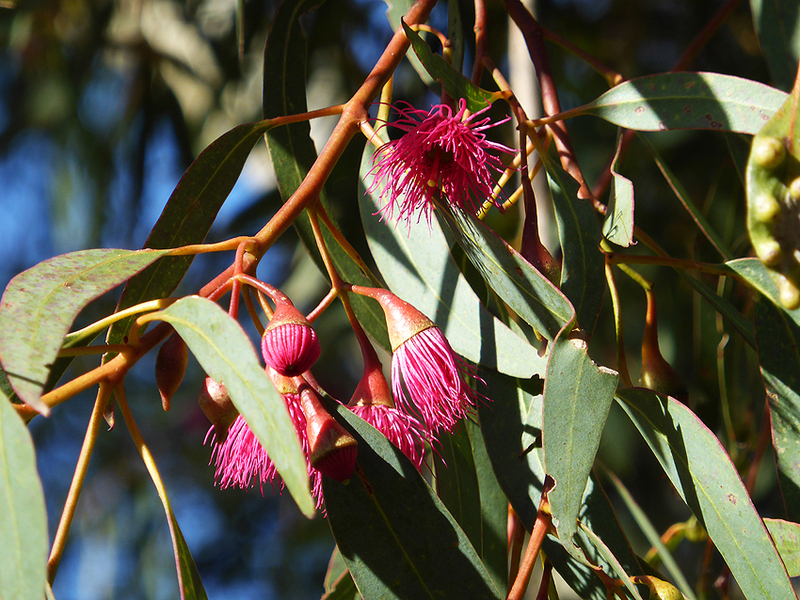 Several small groups of sparrows and some honeyeaters are flitting through the foliage but they seem extremely nervous. The reason for their apprehension soon becomes obvious as a nankeen kestrel perches on a tall pine tree to survey its hunting zone. 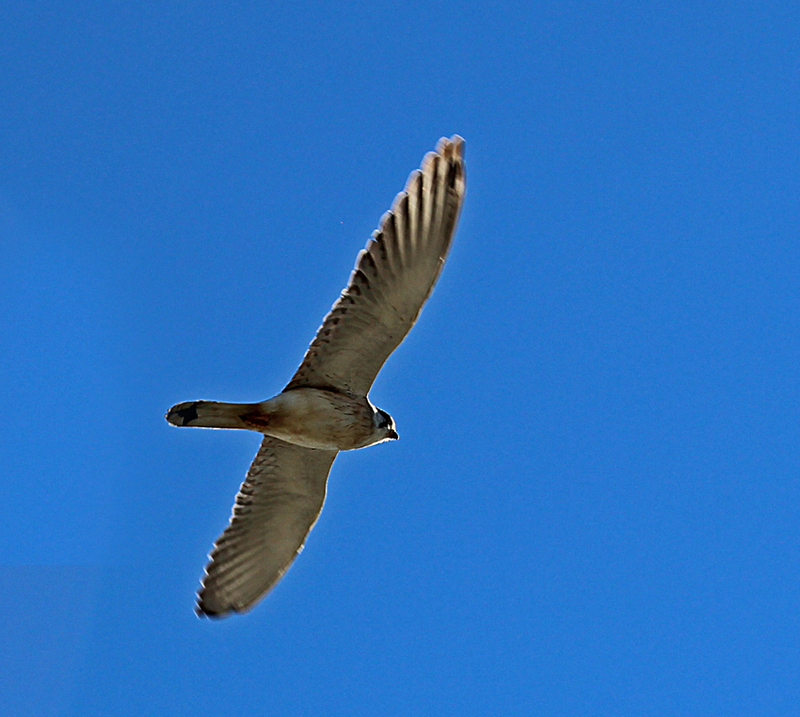 The bird of prey, however, does not go unnoticed by a pair of noisy miners that dive bomb the predator and force it to take to the air again. The temperature is rising and the chance of spotting larger animals diminishing as the day progresses and they seek shelter from the sun. 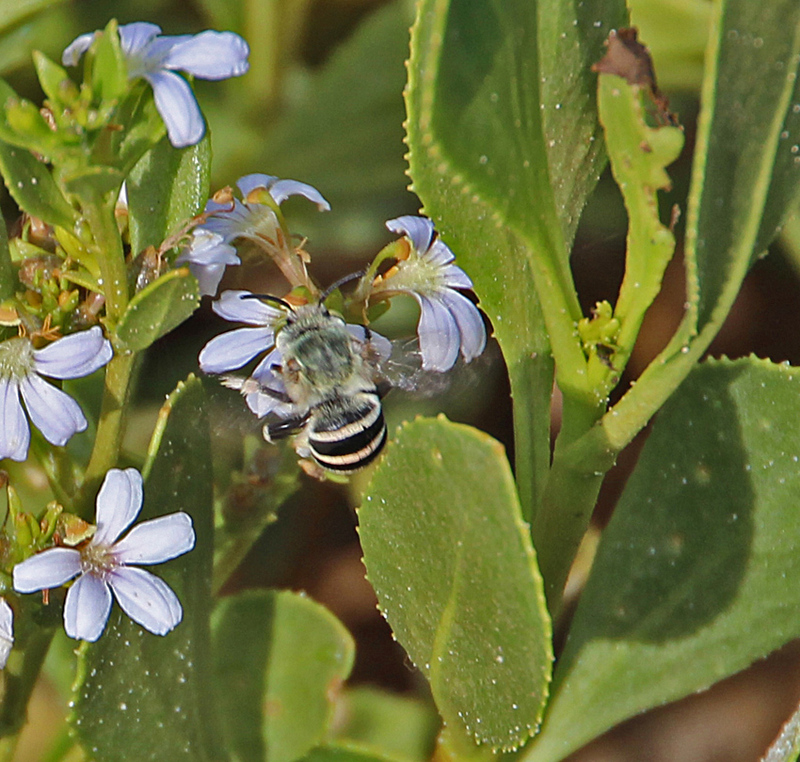 I turn back towards the jetty and focus my attention on the unique coastal plant life and the bees, wasps and butterflies that feed on the various flowering shrubs. 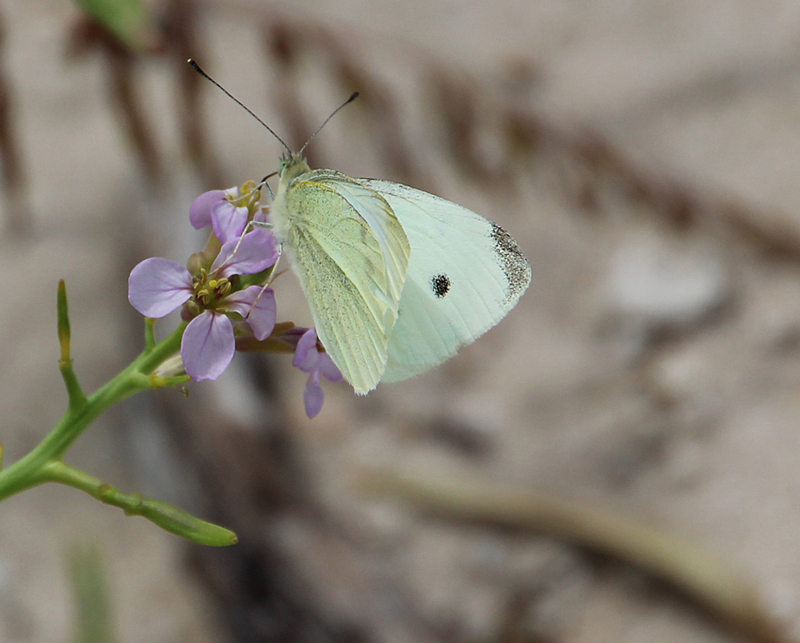 Near one of the sandy tracks that lead down to the water a thick stand of acacias, with delicate blue flowering grasses growing amongst them, is attracting native blue bees and several varieties of butterflies. Tricky images to capture as the bees are speedy, erratic little creatures and the butterflies are only landing on the blossoms for a few seconds. 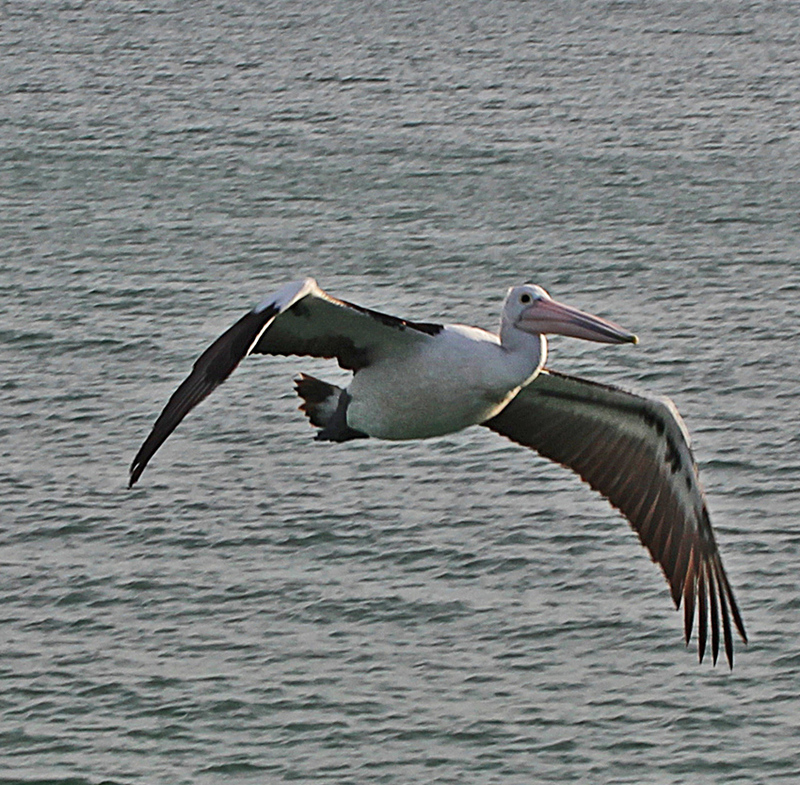 Despite their bulk pelicans are graceful in flight. 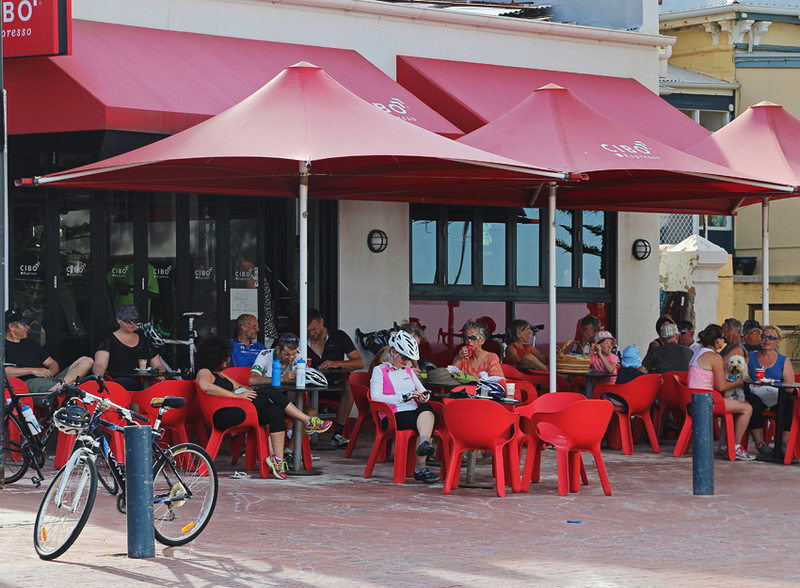 By the time get back to the square I am ready to sit under one of the square’s cafe umbrellas and sip a long cool drink while watching the locals enjoying another warm South Aussie day at the beach. It’s hot now and time to drive home and sort my pictures. I slip the camera strap over my shoulder ready to leave as one final image presents itself. 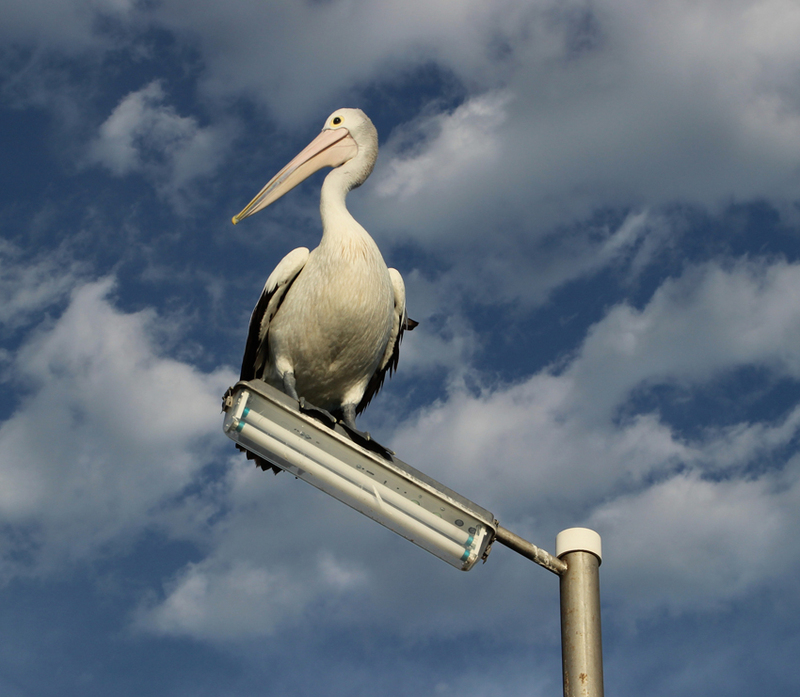 An Australian pelican glides in low over the water and gracefully deposits itself on one of the jetty light poles and glances in my direction…..thanks!! Like all photographers I enjoy equipment. Every so often I can even justify buying a new camera. With an overseas trip to Italy looming I needed a light compact zoom that would fit easily into my pocket. In truth I had been thinking of getting the same kind of equipment to carry when cycling along the parkland trails that I enjoy each weekend. Too often, I had decided not to take my DSLR or super-zoom because thy were that bit too cumbersome or the weather looked threatening. 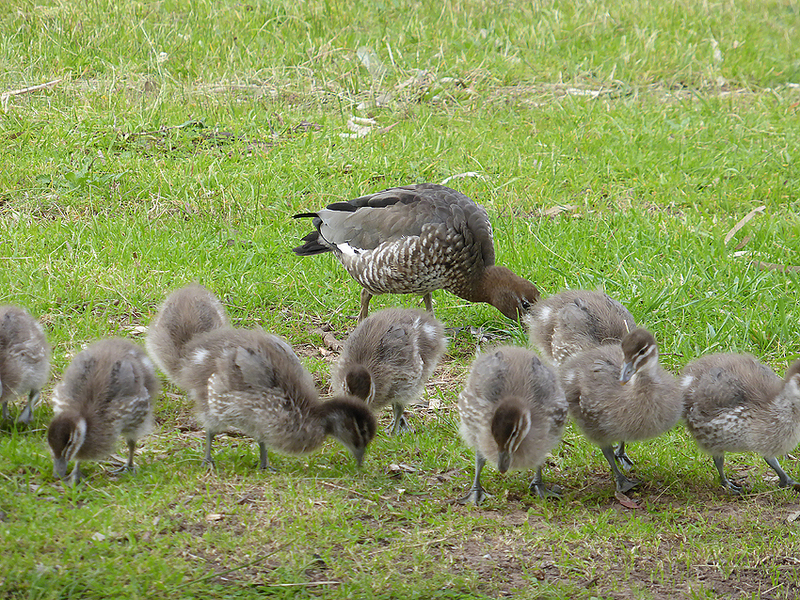 And on nearly every occasion some exquisite little wildlife moment went un-recorded. Small lake near McIntyre Rd; f3.3 @1 320 sec ISO100, click to enlarge all images on this page. A little compact would serve both purposes and popping a plastic bag in my bike pants (not the lycra variety I assure you) would take care of any wet weather problems. My camera of choice was a Panasonic TZ40, a pocket sized camera with a respectable 20x zoom. They were on special with a new model coming out and my old Pana’ FZ40 had always proved a reliable unit capable of producing some extremely sharp images. Armed with my new acquisition, I chose some familiar turf to see what the little camera could do. Tea tree Plaza is a large shopping mall on the north eastern fringe of Adelaide’s suburbs. 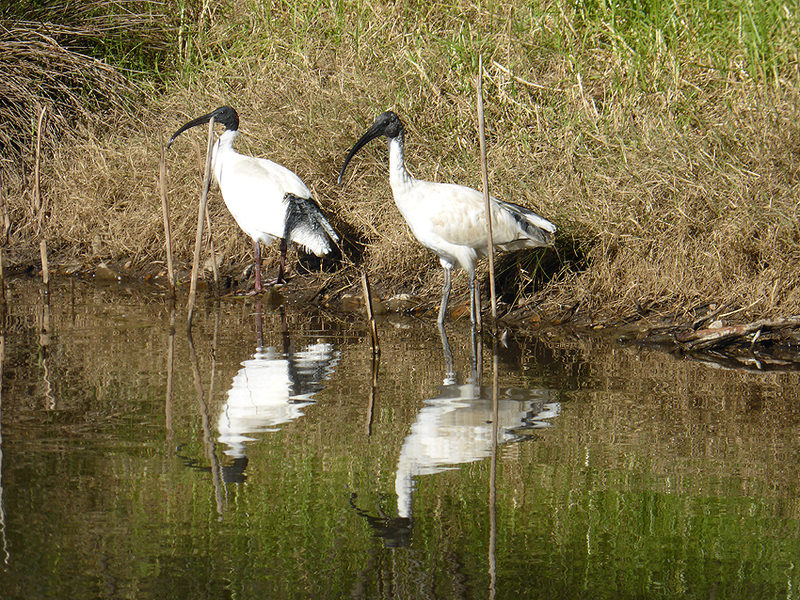 There are some nice cafes to get an early morning ‘cuppa’ before you set off across the adjacent park to intersect Dry creek by the bridge over Montague Road. From there, a network of paths, trails and tracks wind south along the creek towards the coast or north into the foothills. 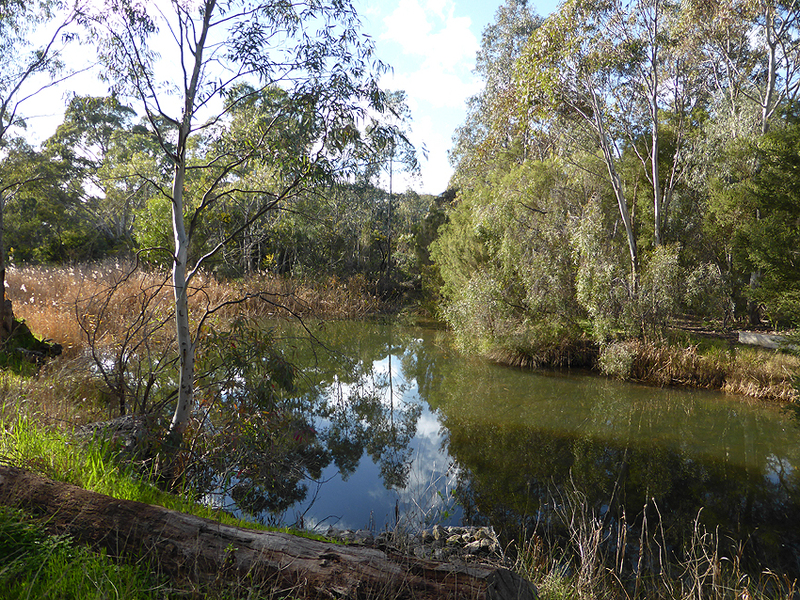 I decided to take the southern bike trail that follows the creek down to McIntyre road then work my way back to the bridge along the bush tracks that hug the other side of the waterway; a nice journey of around 3kms that includes several small lakes, patches of quite dense scrub and some towering old river gums. In this post, I will not describe each particular wildlife encounter, instead the pictures and brief captions can tell the story. There was a little post image tidying up through Photoshop but in my humble opinion the little camera did a good job as a backup and will certainly sit in my pocket on many a bike ride or travel adventure in the future.